February is almost gone and with it the harsh chill of winter, at least as harsh as it gets here in northern California…lol. I have been enjoying the nice weather we’ve been experiencing and the sight of deciduous trees flowering their way into spring. I love to watch the blossoms turn into fruits, and I particularly enjoy seeing the new growth on the fig trees. It’s a time of new life, new beginnings, and new growth for plants and humans alike. It’s a great time to focus and plan to ensure that our growth is positive, productive, and healthy in all realms of our lives. In this issue of Vibrant Living I have posted an updated article from years ago on the use of supplements and whether or not they are even needed on a raw food diet. There are also several new raw recipes, a wonderful new testimony, links to several new web pages on alkaline foods, and the odd quote here and there. Enjoy! “I used to live every day with acute Carpal Tunnel, Plantar Fasciitis and Achilles Tendonitis - since going raw they have ALL completely disappeared, as have severe menstrual cramps. I feel SO sharp and clear in my mind, have energy to spare and recover from intense strength training sessions remarkably quickly. I lived with Irritable Bowel Syndrome, Chronic Fatigue, severe Depression and an undiagnosed constant dry, itchy, painful scalp condition. ALL of those conditions have completely disappeared as well. I feel VIBRANT, STRONG and INSPIRED. I am in love with life. I have also lost 60lbs and continue to lose more as we speak. None of it has returned. There are two new web pages at the website which I think give useful information for those wanting to succeed on the raw food diet. Please enjoy and share with those you care about. I have decided to repost this updated article from years ago because I feel the content is so important and I get many questions on the subject. 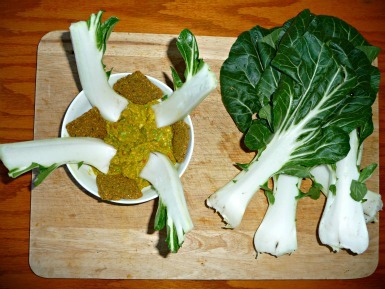 Is Supplementation Necessary on a Raw Food Diet? I’m often asked my opinion on different supplements and whether or not supplementation is even necessary on a raw food diet. This comes up so often that I thought I would share some of my thoughts about the subject with you today. In an ideal world I believe we would all eat the food of the earth in its natural state and receive all the nutrients our bodies need to not only be healthy, but to thrive. Some issues I have with that model are that we live in a world that is no longer natural, and that man’s encroachment on nature has significantly affected the nutritional value of our food, and perhaps more importantly most of us are born with compromised health in some form or another even though it may not be outwardly visible and immediately apparent. Often we say, oh, dental issues run in my family, or poor eyesight, or heart issues or you name it, when in fact these “issues” are probably nothing more than generations of nutritional deficiencies, self induced toxicity through diet, and perhaps a little inbreeding along the way. Because of scientific and technological advances over the years, each generation lives further from the natural ways of our ancestors. We are born in a vortex of nutritional deficit compared to generations past, so we can get away with far less in terms of the toxic burden we can put on ourselves before we suffer negative health consequences. These consequences may show up as type 2 diabetes, arthritis, osteoporosis, heart disease, cancer, depression, ADD, or a myriad of all the other “dis-eases” we see popping up in younger and younger people today in our society. I believe that taking “natural” supplements, meaning supplements made from whole foods and processed minimally by those with an understanding of the fragility of the nutrients and the desire and commitment to bring a truly healthful product to market may be prudent for most and necessary for many to help them live healthily in our world as it exists today. I would say that the exception to this might be those growing close to 100% of their own food in a pristine environment with mineral rich soil. Taking nutritional supplements that are synthetic, as most are, or those from natural origins not processed with care, can at the very least produce nothing but expensive urine and feces, and could throw your body further out of balance and add toxic load to your already compromised system leading to dis-ease. Proper natural supplementation can assist the body in receiving 100% of the nutrients it needs to run effectively and carry out the multitude of functions that make us whole, healthy and happy. When we add the deficient nutrients back into our diet, miracles can take place as these wonderful bodies of ours carry out their work as nature truly intended. Sometimes supplementation may be short term to allow the body to regain balance and then their use can be discontinued. Vitamin B12 is known as the “energy vitamin,” and it is essential for many critical functions in your body, including energy production, supporting your immune system, and helping to regulate the formation of red blood cells. Recent studies from the US Framingham trial show that one in four adults in the US are deficient in this vitally important nutrient and nearly half of the population has suboptimal blood levels. Research suggests that up to 85% of people could be deficient in vitamin D without knowing. Scientists believe that vitamin D serves a wide range of fundamental biological functions relating to many aspects of your health and is responsible for the regulation of over 2,000 genes in your body. Current scientific research suggests that all cells and tissues in your body have vitamin D receptors and every cell and tissue needs vitamin D for its well-being. Your skin naturally produces your body's supply of vitamin D from direct exposure to bright midday sun with a mere ten or fifteen minutes' exposure per day. But for decades, misinformation from the media and conventional medicine has created a fear of sunshine. Most people either intentionally or unintentionally avoid the sun -- or smear on sunscreen that blocks the beneficial wavelengths that produce vitamin D in your skin. And of course for many of us during the winter months the sun is not available for days and sometimes weeks at a time. These are the two most common vitamin deficiencies in the US today, but I believe there are other major nutrients missing from most diets today, and yes, even raw food diets. Because of the environment, our past diets, and the toxic load we each carry it’s probable that we all are mineral deficient to some degree, which is why I am such a proponent of consuming large quantities of fresh quality greens, and why I also supplement with a high quality super green powder almost daily just as an insurance policy. There’s that term again, “quality”; I believe it’s best to put the very best fuel into our bodies to get the very best results. I add a heaping teaspoon of Ormus Greens or Vitamineral green to my smoothie every morning and really feel great because of it. Sometimes I add more, or add a little chlorella, spirulina, or blue green algae depending on how I feel that day. 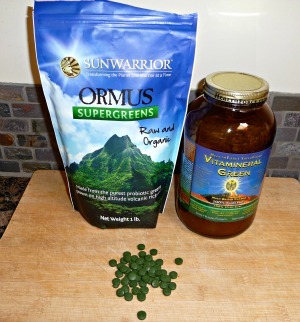 The super greens are also great for traveling when it’s not always easy to get your daily greens. I can’t tell you enough how important I feel getting lots of greens into your daily diet is. I see it over and over again where people are struggling and by upping their greens they balance out and feel much better. One reason for this is the afore mentioned, that many of us are already mineral deficient, and the other is that any type of cleansing diet (the raw food diet being a major cleanser) will require more minerals to deal with the acid wastes being flushed out in the cleansing process, and just as important, require the full spectrum of vitamins and minerals for rebuilding a healthy strong vibrant body, mind, and emotional matrix. I think almost everyone could benefit from adding some super green foods into their diet and as the statistics show maybe supplementing with B12 and Vitamin D as well. In the case of the vitamins you may want to have some testing done to see where your current levels are before adding these to your diet. Listed below are a few labs that will test for a multitude of nutrients and issues, and of course many naturopaths and forward thinking M.D.’s provide testing as well. There are those that believe we can get all our nutritional needs met by following a natural raw food diet. They cite man’s history not only living and surviving, but thriving on raw foods for eons. And there may be those today who can emulate that model, but I feel for most of us living in this modern day world separated from our natural environment and its roots, that supplementation may be necessary at the very least to rebuild to a level of health where we are past deficient, and have adequate reserves built up so that our natural food choices provide all that we need to be healthy and happy. No matter what your thoughts are on the subject, getting tested couldn’t hurt and would actually be quite a useful diagnostic tool for benchmarking where you are today. I as well as a number of leaders in the raw food community believe that occasional testing is a great way to be pro active and stay ahead of the curve in maintaining great health. It’s great to have a reference point to look back on later and see how your personal markers have changed as your health has improved. Just last week Gretchen went to a Lifeline Screening Center to have some basic diagnostic tests done, and I decide to accompany her and have some tests done as well. I don’t have the full report yet, but do know my cholesterol, triglycerides, blood sugar, and liver enzymes are all in better than good shape, which to me is a testimony of my 21 year vegan lifestyle, the past 13 of those 100% raw. My personal preference would be to glean all my nutrition from the fresh raw food that I consume, but at this point in my journey I still feel some supplementation is important for me to remain healthy and thrive. Since my personal goal is to enjoy vibrant health, I choose to supplement if needed rather than to be hung up on any dogma about what is truly a natural way of eating. I hope my perspective has helped you move forward in discovering what is right for you and your situation.